After multiple Allegiant Airline flights were diverted due to weather conditions, hundreds of passengers were left stranded at the Punta Gorda airport overnight on Sunday. 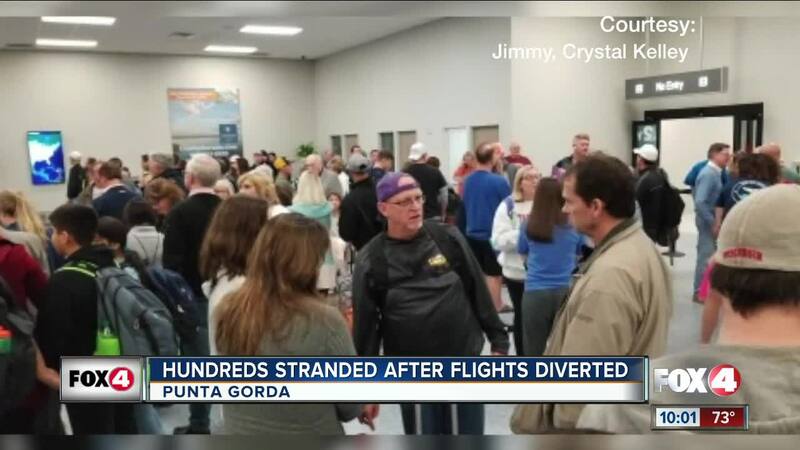 PUNTA GORDA, Fla. — After multiple Allegiant Airline flights were diverted due to weather conditions, hundreds of passengers were left stranded at the Punta Gorda airport overnight on Sunday. A total of 10 flights en route to Orlando Sanford International Airport were diverted because of thick fog, according to Allegiant. The flights were split among Punta Gorda, Fort Lauderdale, and St. Pete airports. Three of the flights were sent to Punta Gorda and affected about 300 people. Passengers landed there around 12:30 a.m.
Carolyn Schorse said she and her husband Mark just wanted to make it to their new home in time for the New Year. “I would think by law they’re responsible for getting us to our destination. Not somewhere else,” she said. Allegiant Airlines Director of Corporate Communication Hillary Grey said it was difficult to arrange ground transportation for the affected passengers. "Normally, Allegiant tries to arrange transportation, but because of the holiday weekend there were no available buses or group transportation," Grey said. The airline did not offer passengers hotel vouchers either. Mr. Schorse said he considered paying out of pocket for a hotel, but then reconsidered. “Do I really want to get a hotel room at 12:30am in the morning and I’m going to be checking out at 8 or whatever? It was rally unfortunate,” he said. No flights were rescheduled. Instead, the airline asked customers to arrange their own ground transportation and submit their receipts for reimbursement. "All passengers that were affected were contacted in the terminal and via email on how to send in their receipts and a customer service number to call," Grey said. But Mrs. Schorse said no one gave her instructions in the terminal. Grey said the airlines appreciates customer's patience and it's always a priority to get customer's to their destination safely. it took the Schorses an additional two hours to get their luggage. they say luckily they were able to hitch a ride with strangers who were headed in the same direction. they made it to Orlando around 8 a.m. Sunday. Schorse said she hopes they will make changes to prevent this from happening again. and she says her children will be flying allegiant in the next few weeks to visit her and her husband in Orlando.